You can pay with any major Credit Card using direct checkout. I accept Visa, MasterCard, American Express, and Discover. You may also use PayPal to submit payment. PayPal accepts Visa, MasterCard, American Express, and Discover, or you can pay using your PayPal balance. Yes. SweetheartsandCrafts.com is a secure site. You pay through PayPal or Stripe, the world's premier electronic payment solutions processing billions of dollars every year. I will never even see your credit card number; PayPal or Stripe just notifies me that a payment has been made and I make your items. I receive the money you've paid through PayPal or Stripe later. Quilling is also known as paper filigree. It involves curling, rolling and scrolling thin strips of paper into various shapes for decorative and artistic purposes. It is an art form dating back to Ancient Egypt and popularized during the Rennaissance. Nuns would use the gilded edges of the Bible to quill intricate religious pieces and decorate book covers. The name "quilling" comes from the old practice of coiling paper strips around goose feather quills, rather than the nifty quilling tools we have available today. Jane Austen even cites quilling in her novel "Sense and Sensibility". YES!!! I love making custom orders and some of my best work has come from the minds of my customers. I take custom orders on jewelry as well as wall art. If you would like a custom order please send me a message. If you like something you see but want it in a different size, color, or something uniquely you, I would be delighted to handcraft your ideal piece. 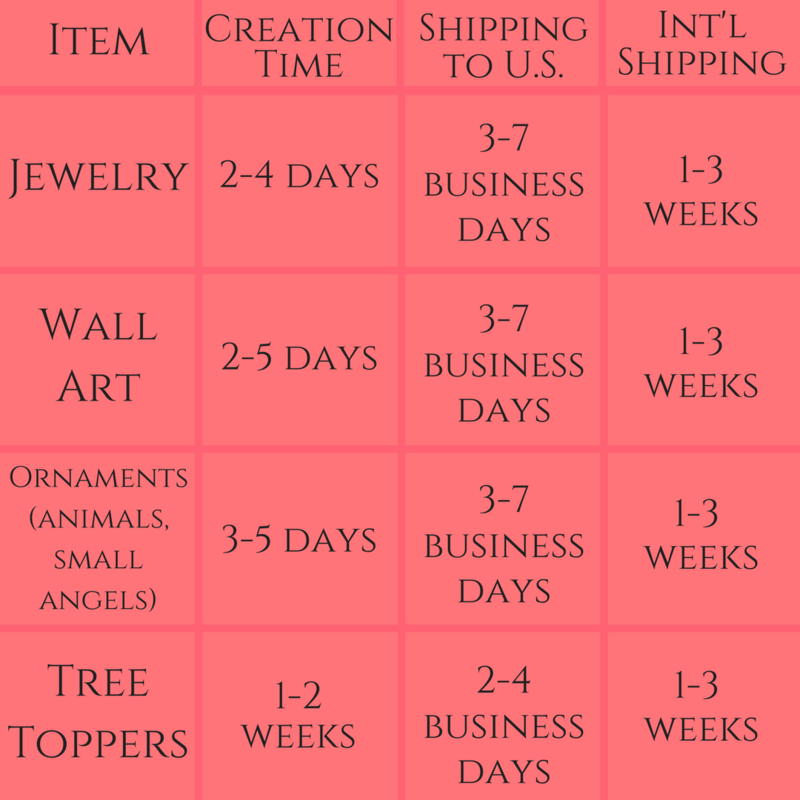 Prices for custom orders will vary and payment must be received before I begin making your piece. What if I want a different size than what's pictured? Nearly all jewelry items can be made larger or smaller than listing size. Just ask me about making your piece a different size and I'd be happy to accommodate! It really depends on the piece. A small pair of earrings with only a few components may take a few hours. However, larger pieces, more detailed pieces, and ornaments can take a few days to complete. My wall art takes a minimum of 24 hours to complete, as the image must dry overnight. What colors do you have for quilling? Most colors you can think of! I have quilling paper in over 90 different colors, including metallics. I do my best to properly describe my items and take accurate photographs of all items. Please be aware that colors may vary on different monitors. What are the niobium hooks you offer for your earrings? Niobium is a natural element which is non-reactive and truly nickel free, allowing people with sensitive skin and allergies to still delight in the joy of jewelry. If you are allergic or sensitive to certain metals, niobium jewelry is a perfect option for you. It is naturally nickel free, hypoallergenic, and strong enough to create beautiful jewelry without the need for other metals. In fact, niobium is so non-reactive that it is often used in surgical operations like knee and hip replacements and is extremely compatible with the human body. Niobium is represented on the Periodic Table of Elements as Nb by atomic number 41. How do I care for my paper quilled jewelry? All of my quilling has been hand painted with several layers of special paper sealants. The sealant soaks into the paper, making it stiff, sturdy, and suitable for everyday wear. The sealant I use also makes my work water resistant and UV resistant. It will not fade over time and can simply be wiped off with a cloth if it gets a little wet. Just as you would care for any precious piece of art, proper storage of your jewelry and/or ornaments in a jewelry box is advised and will prolong it's life. Do you offer gift wrapping and personal messages? All jewelry and ornaments will arrive in beautifully packaged boxes. Wall art and larger items will arrive gift wrapped in tissue paper. All items are wrapped with a ribbon and optional gift tag, ready for giving. Giving your item as a gift? Send me a message and I'll write a personalized note to the recipient for you! All items are created and packaged in a smoke-free, pet-free environment. What is your wholesale availability? Wholesale orders available on a per-case basis. Please send me an inquiry for further information. All items from Sweethearts and Crafts are handmade to order and most will be shipped within 1 - 3 business days after payment is received. Orders containing wall art will require a minimum of 24 hours, as each piece must dry overnight. 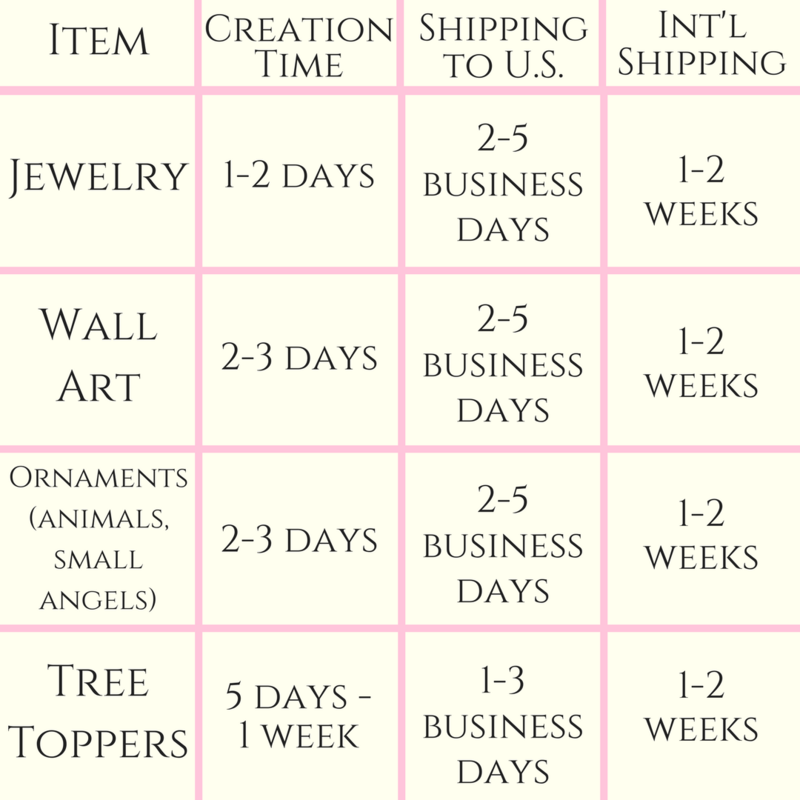 All custom orders typically take extra time. All items are shipped via USPS First Class Mail. I'll do my best to meet these shipping estimates, but cannot guarantee them. Actual delivery time will depend on the shipping method you choose. Times are extended during the holiday season as noted by the red table. Please note Sweethearts and Crafts will not be responsible for any customs fees or import taxes that may apply and are payable to the buyer. Sweethearts and Crafts is not responsible for delays due to customs or postal strikes. I gladly accept returns and exchanges within the provided timeframes. Ship items back to me within 14 days of delivery. I don't accept cancellations barring any highly unusual circumstances,but please contact me if you have any problems with your order and I'm happy to work out a solution. Unfortunatley I cannot accept returns on custom or personalized orders unless they arrive damaged or defective, due to the nature of these orders. Digital downloads are also not eligible for returns. Please note that buyers are responsible for return shipping costs in most cases. If the item is not returned in its original condition, the buyer is responsible for any loss in value. What if I have another question you didn't answer here?